DETROIT, Jan. 9, 2011 -- Volkswagen of America, Inc., today announced the world debut of the all-new Passat, a transformational car in Volkswagen's ambitious growth plan for the U.S. market. 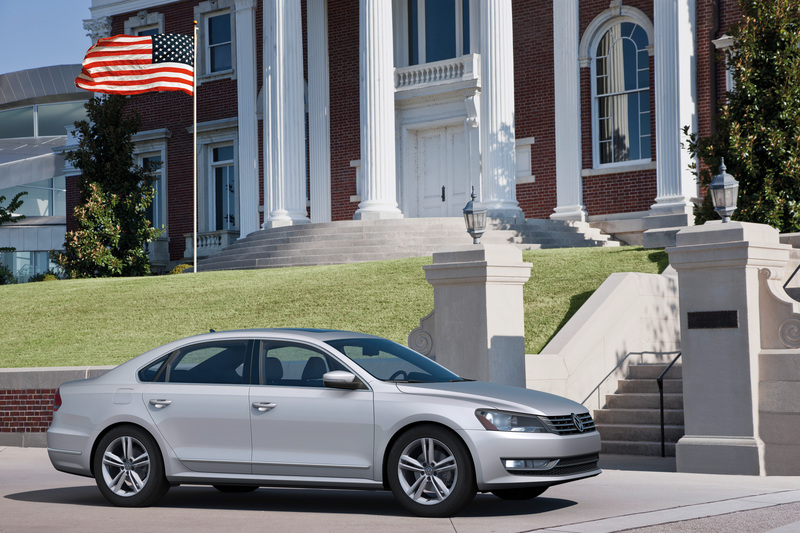 Designed in Germany and made in America, the Passat was developed as a larger vehicle with premium features and handling characteristics that will perfectly match it with the tastes and lifestyles of Americans. It will be built in Chattanooga, Tenn., at the world's newest, most advanced and environmentally responsible auto assembly plant. The new Passat, the largest ever, is the only midsize sedan that offers superior German engineering at an accessible price. The Passat TDI -- the only clean diesel option in the segment -- is expected to deliver 43 miles per gallon on the highway, with a range of approximately 800 miles. Final pricing will be announced in the spring, but the Passat will start at around $20,000 when it arrives in dealer showrooms later this year. It will come with premium standard features that include automatic climate control and Bluetooth connectivity. The new Passat offers best-in-class legroom, Volkswagen's Care Free Maintenance program (3 years/36,000 miles) and the safety of Volkswagen's Intelligent Crash Response System. Volkswagen's new Chattanooga plant that will produce the Passat is part of a $4 billion investment by the company in the U.S. market. The environmentally friendly facility includes a revolutionary paint shop that significantly reduces emissions. A state-of-the-art $40 million employee training center ensures adherence to Volkswagen's exacting quality standards. The Passat will set new benchmarks for safety, driving performance and environmental responsibility in the midsize segment. The all-new Passat offers three drivetrain options: a responsive 2.5L gasoline engine, a remarkably eco-friendly 2.0L TDI Clean Diesel and a powerful 3.6L VR6. The 2.5L five cylinder engine (170 hp/177 lb.-ft.), which is being offered in the Passat for the first time, will be mated to a standard 5 speed manual transmission. As an alternative, the 2.5 multi port injection engine may be paired with a 6-speed automatic. The quiet, four cylinder 2.0L TDI Clean Diesel (140 hp/236 lb.-ft.) has the power of a six cylinder gasoline engine and the fuel economy of a hybrid. The Passat TDI is expected to deliver 43 miles per gallon on the highway, with a range of approximately 800 miles. Volkswagen's TDI clean diesel engines, which come with a NOx storage catalytic converter, are among the cleanest engines in the world, fulfilling emissions requirements in all 50 states. Optional on the Passat TDI will be Volkswagen's legendary 6-speed DSG transmission. The 3.6 liter VR6 (280 hp/258 lb.-ft.) makes the new Passat a top-flight sport sedan. It offers power and luxury-class driving comfort, with European-type restraint in its fuel consumption -- estimated at 28 mpg on the highway. Gear shifting on the new Passat VR6 is handled by a standard 6-speed DSG; the dual-clutch transmission is considered the most efficient automatic in the world. This technologically advanced six-speed transmission incorporates an automatic dual-clutch system that instantly engages and disengages gears without the need for a clutch pedal. With a special computer controlling the process, one clutch is engaged on the next gear while the clutch from the previous gear is released. The results are crisp, quick shifts, without the loss of power that is experienced with a traditional manual gearbox. The Passat will be offered in three trim levels, S, SE and SEL, with a total of 16 equipment levels. All will offer first-in-class safety and comfort. The Passat's safety features include Volkswagen's advanced Intelligent Crash Response Systems, which initiates automatic safety protections in a collision -- the fuel supply and high consumption electronic equipment shuts off; the doors unlock; the battery terminal disconnects from the alternator cable; the hazard lights switch on. The Passat also comes with a tire pressure monitoring system, ESP electronic stabilization program, ABS with braking assistant, Hill Climb Assist (with manual transmission), six airbags and an extremely rigid body structure to protect the driver and passengers. The Passat sets new standards for comfort, with a significantly larger rear seating area, best-in-class rear seat legroom, well-designed controls and superior touring properties. Other standard features include automatic climate control, power windows all around, air conditioning, insulating glass, a distinctive analog clock at the center of the instrument panel, cruise control, outside temperature display with frost warning, radio-CD system (MP3-capable, plus external audio input) and Bluetooth connectivity. Premium options include 17- and 18-inch alloy wheels, power seat adjustment, leather, leather-trimmed multifunction steering wheel, a touchscreen satellite radio, a choice of Volkswagen's RNS 510 or RNS 315 navigation systems, front fog lights with static cornering lights, wood decor, new ambiance lighting, memory driver's seat, power passenger seat, and keyless access with push button start. The Passat will also offer the new Fender premium audio system, designed exclusively for Volkswagen. In a partnership that combined quality automotive engineering and quality sound engineering, Volkswagen and Fender teamed up to bring the raw emotion of live music to the driving experience. The Passat's balanced proportions give it a unique, timeless and dominant styling reflecting the "design DNA" developed by Walter de Silva, the Italian design chief for the Volkswagen Group, and Klaus Bischoff, the German design leader for the Volkswagen Brand. The signature clean design, with a predominance of horizontal body elements, reinforces the Passat's position as the sophisticated choice in the midsize segment. The bottom line: this car looks much more expensive than it actually is. The key identifying feature of a strong brand is the styling of its front end. Here the Passat displays the new horizontal brand face, with the grille and headlights forming a single unit. Unlike models in the compact class, the Passat's grille is sculpted in a three-dimensional shape. Moreover, the grille stands more upright and makes a more distinctive and elegant impression in its stricter geometry. From the side profile, the muscular ridge in the sill area creates a lively interplay of light reflections. Powerfully sculpted wheel arches emphasize the dynamic properties of the Passat. In the balance of the side profile, the roof lines flow toward the back with a nearly coupe-like cut of the rear window. Three side windows create luxury class style with a long, extended glass surface. The rear section is also dominated by horizontal lines. The lines of the large taillights rise toward the sides, underscoring the dynamics of the elegant rear styling. Another unique feature here is the design of the two-part taillights (integrated in the rear fender and trunk lid). The Passat shows the look of considerably more expensive cars. The new, larger Passat is 191.7 inches long and has a 110.4 inch wheelbase, which translates into a noticeable increase in rear seating space. Like the exterior, the interior is also marked by a clean and geometric formal structure. Interior styling consistently follows the maxims of functionality. Controls are attractive and easy to operate. The instrument panel is similar to that of Volkswagen's flagship vehicle, the all-new Touareg. Chrome trimmed gauges surround a digital multifunction display. A high-end chrome look is also applied to the air vents in the cockpit, and to the surrounds of the radio, navigation system and the climate control panels. The rotary light switch and parking brake handle button are also treated in chrome. Except for the base version, all other Passat trims have chrome interior accents on the window, mirror adjustment and trunk opening switches. The upper and lower instrument areas are visually distinguished by various decorative accents, depending on the equipment version. Decorative elements in "Titan" design are used in the S version; the elegant "Titan Silver Printed" decor is used in the SE version, wood decor "Autumn Nut Burl" is featured in the exclusive SEL version. The accents not only upgrade the instruments, but also the center console as well as the door trim panels. The seats are exceptionally comfortable. Even in the base version, the driver's seat is adjustable eight ways, including lumbar support. The new Passat and the all-new Jetta are expected to be the sales leaders in Volkswagen's plan to significantly increase market share in the United States. The company's strategy is built on a broad portfolio of products that offers cars accessible to the majority as well as vehicles for car enthusiasts.